Our earthly existence is not by accident or something that happened by chance. It is a coded plan that existed in the mind of God which came to fruition at a certain point in time in history. It is something that God knew, destined, willed, and finally actualized. The first reading of today which is dedicated to the call of prophet Jeremiah can as well be addressed to all of us. God says “Before I formed you in the womb I knew you; before you came to birth I consecrated you; I have appointed you as a prophet to the nations. Most often, this expression is used by those called to the ministerial priesthood, to indicate that God ordained their vocation even before they were born. Yes, it is true but the above expression is meant for each and every one of us. Here lies the implication that our mission on earth is ordained by God and that it is not out of chance that we came into existence and so, we have to give an account of our mission to Him who approved our coming into this world. The second part of this reading are words of divine consolation. God promised to make us a fortified city, a pillar of iron and wall of bronze. That though our enemies and the devil will always wage war against us, that we should not be afraid, they will not overcome us because He is always with us and ever ready to deliver us. If God is indeed for us, who shall be against us? Resting our hope in this divine consolation, we have to place our faith and trust in God at all time because He knows us through and through even our mission here on earth. In the second reading, St. Paul gives us the theology of love and that nothing on earth can be used as a substitute to this heavenly virtue which we are called not only to embrace but also to practice because it is the only virtue that remains when all other virtues must have gone or cease to exist. At the beginning of this reading, Paul admonishes us to be ambitious for higher gifts but he at the same time warns us that this ambition must be rooted in love. 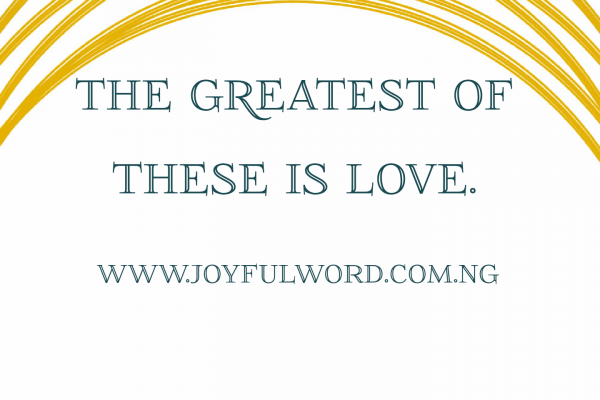 This is because God Himself is love, He created us out of love even when our first parents failed to love Him back and disobeyed Him, God out of His divine love did not abandon us to the domain of death but redeemed us through Christ. St. Paul used himself as an analogy in this second reading that he may have gifts of eloquence, prophecy, tongue, strong faith, and understanding but without love, that these gifts are nothing. In fact, love is the heart and at the center of our Christian identity and vocation. No wonder then that before His ascension, Christ advised His Disciples to love one another because it is through this that people will know that they are His disciples (Jn 13:35). He did not mention other virtues which are very important in themselves but urged them to begin with love because love is the root for other virtues to be cultivated and it has no substitute. If we don’t have it, we don’t have it. It is as a result of lack of love as we reflected some time ago that leads many today into the life of hatred, gossips, destroying one another, ingratitude and lack of appreciating one another’s gifts, character assassination, envy, and greed. St. Paul in a nutshell, defines what love is not and what love is in this reading by saying that love is always patient and kind, it is never jealous, love is not boastful or conceited (excessively proud of oneself), love is never rude or selfish, it does not take offence, and it is not resentful. He moves on to say that love does not take pleasure in other people’s sins but delights in the truth, always ready to excuse, to trust, to hope, and to endure whatever that comes. It is from this very understanding that we can see why Christ was rejected in His home town as a result of lack of faith. The reason for their lack of faith is because of their lack of love. They failed to love their own brother Jesus and appreciate the gifts that God endowed Him with because they knew His root, His Parents and relative. We can now see that lack of love can as well be an obstacle of manifesting our other gifts to the fullest. Lack of love can as well bring about lack of faith as we witnessed in the gospel of today. It is lack of love that makes many today instead of focusing on the gifts that the other person has, they will begin to ask where is he/she from, I know him/her, his/her family is nothing to write home about, he/she is from a poor background, where did he/she get this knowledge, power, and gifts? This is exactly what Christ suffered in the gospel of today. All these questions are not necessary if there is an authentic love existing in our various Churches, families, groups, and communities. Let us pray for the grace of God so that we will allow the gift of love God has given us to take its proper shape and root in our spiritual lives so that other virtues can spring up. Therefore, let us persevere in love so that our spiritual and social life will be constantly supplied with good nourishment. Let Us Pray: Lord Jesus, give me the grace to love as you have loved me and with your love may I win souls into your kingdom. Amen.